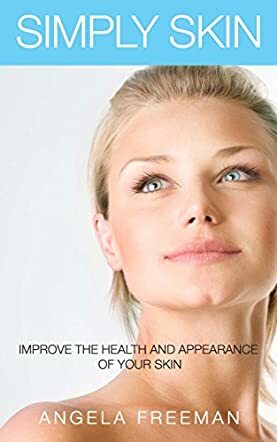 Simply Skin: Learn How to Improve the Health and Appearance of Your Skin is a nonfiction health and beauty self-help book written by Angela Freeman. Anyone who is concerned about their skin, and everyone should be, will no doubt have encountered a bewildering profusion of products and services offered in their local beauty supplies store and online. But, not every product, no matter how highly touted, is suitable for every skin type or issue. In her book, Freeman aims to dispel the confusion many experience about skin care products and services. She begins with a discussion of skin, which is actually the largest organ of the body and is comprised of three layers. The outer layer, the epidermis, is composed of cells which slough off and renew themselves. While most of us are primarily concerned with that outermost layer, the three layers act together to protect the body against toxic and harmful effects of the environment. Freeman sets out the parameters needed to determine your skin type and then discusses the different skin care regimens appropriate for each type. She differentiates between cleansing, exfoliating and moisturizing, and sets out how readers can easily use masks and facials at home and on a regular basis. Freeman also discusses sunblocks and sunscreens, and she demystifies SPF ratings. She also gives information on skin conditions such as rosacea and psoriasis, and discusses the treatment options that may assist in dealing with those conditions. Simply Skin is a well-written and informative guide to skin care. I especially appreciated the information she provides on sun care and the different types of sunblock and sunscreen products available. Her information on anti-inflammatory diets and their role in helping control skin conditions is also invaluable. Freeman’s writing style is easy and conversational, making reading her book a pleasurable as well as an informative experience. Simply Skin: Learn How to Improve the Health and Appearance of Your Skin is most highly recommended. Simply Skin by Angela Freeman may be the first skin care book I have read in my entire life. I simply haven’t had any problems with my skin, or any other parts of my body. I have always been lucky that way. This book will help you learn how to improve the health and appearance of your skin. I was more concerned with the health aspects than appearance, but both are important. I spend three months of the year in Thailand, a tropical country where the environment is conducive to the growth and spread of every kind of skin disease known to man. I spend the other nine months of the year in Saudi Arabia, which has an arid desert climate that causes its own problems. I wanted a book that would help me maintain good skin care in both climates and Simply Skin was the perfect solution to my problem. Simply Skin is well organized and well written. There are answers to skin problems in here that I have never even heard of. If you have any questions about your skin, then this is the book for you. Angela Freeman has created 15 simple rules that are designed to get your skin in optimal condition and help it stay there. I find these kind of routines or regimes are essential to your overall health strategy as you get older. I am not a skin expert or any other kind of health specialist, but I think we should all have some basic knowledge about our bodies and, as far as skin goes, Simply Skin gives you the foundation that will guide you in the right direction as you try to maintain your skin’s health and appearance. Sometimes it takes a headline like this: “Woman undergoes vision surgery after sleeping with mascara on for 25 years” to remind women of the importance of removing all their makeup each night. And while A. Freeman, the author of Simply Skin, points out that current makeup and foundations, especially those made by reputable companies, are generally tested and safe, it takes books like this one to drive home the message that truly beautiful skin requires care, not cover-ups. Simply Skin is a very easy-to-read breakdown of the why’s and how’s of properly looking after our skin. And even for those of us who follow a daily skin regimen, as I do, A. Freeman’s book offers down-to-earth info about why we need to cleanse with more than water 2 times a day; what toners are for; why exfoliation to remove dead skin cells helps keep the skin beautiful, why moisturizers are important and how to determine the best product for your skin type. Freeman also fills us in on the current skin care buzzwords like serums and hyaluronic acid. Can our skin really benefit from using these sometimes high-priced products? And if you’ve never tried steaming your face using essential oils, how should it be done? I wasn’t aware of this practice, but now I’d love to try it. What else might readers find especially useful in Simply Skin? The comprehensive, yet easy-to-understand explanations of the differences between various skin problems like psoriasis, rosacea and eczema, along with advice on how to best treat such conditions are excellent. Of course, you can find a lot of this information online, but when you need a quick reminder, having Simply Skin nearby might just be quicker. Perhaps one of the best things about Simply Skin is that it doesn’t come, as so many such books do, with ads and/or plugs to buy any particular products or visit the author’s site to buy the products she uses in her own skin care business. If you are a woman who believes thoroughly in proper skin care, Freeman’s little book will reassure you that you are doing the right thing by following a good skin care regimen. Freeman sends us off with the reminder that “Your skin is like a barometer: it reflects what is going on internally, mentally and is subject to external factors. Listen to it; analyse it; look after it.” Amen!